There was a book called Can Do Duck and the Storm. A story about a duck and his friends that experienced a hurricane and how they coped, written by Ducktor Morty, M.D. and Esther Deblinger, Ph.D. 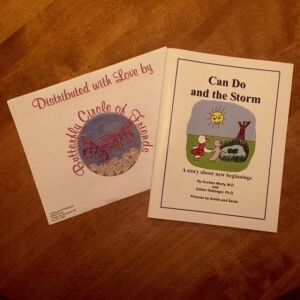 The book was created to give adults a tool to help the children in their lives to express their feelings after a natural disaster. With the permission of Morty, we printed a few hundred copies of the book to share at a local Thanksgiving dinner for those families affected by Hurricane Sandy. In January 2013, we printed 5,000 copies of the book. Distributing them throughout New Jersey and New York. By October 2013 all the books were distributed. We hope that the families who received these wonderful books have found a way to cope thru the difficult times.